This year, the third warmest in recorded history, spring has come a month early, with regions all across the United States experiencing May temperatures in March. While warmer temperatures are welcome after a cold, wet winter, the cause is not. Oceans are warming and rising, and last year was the fourth consecutive year of mass seal pup strandings along local beaches due to reduced populations of anchovies and sardines. Glaciers are melting and collapsing at record rates. Heat waves and fires are likely to threaten our placid summers. Worse disasters loom in our children's future. The Nation, climate deniers know its consequences full well: addressing climate change means not only ending the flow of their black gold—it's the end of their entire way of life. "To lower global emissions," she writes, "can only be done by radically reordering our economic and political systems in many ways antithetical to their 'free market belief system." Hence, oil companies have invested billions to convince much of the voting public that climate change is a hoax and accomplished the ultimate coup d'état with the installation of a like-minded government that will raise the temperature, and the consequences, even more. But we still have a chance to pull back from our race to the edge. There is a climate-change solution that can take root at the local level which can actually reverse climate change by at least 40 percent. By changing the way we grow food, we can actually draw down carbon from the atmosphere and put it to good use where it belongs: in the soil. Call it carbon farming. 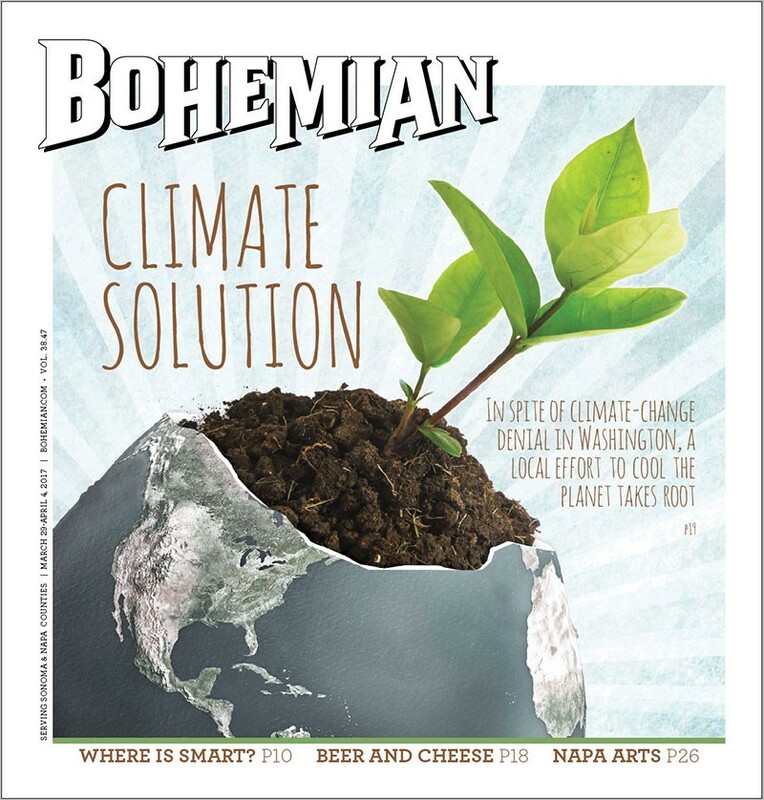 North Bay farmers have led the way with these techniques, and with the help of climate-advocacy groups, they won state support to promote a program that just might save the world. The Healthy Soils Initiative, launched Jan. 11 in Sacramento by the National Resource Conservation Service and the California Department of Agriculture, encourages farmers to adopt carbon-friendly farming methods by offering grants and training assistance. Grant applications will be accepted later this spring. Judging from the number of people who turned out for the September Healthy Soils Summit—over 200 for the conference itself and many more via webcast—interest in this carbon-friendly "regenerative" soil-management program is growing. It can't come too soon: the very existence of topsoil is at risk. The World Wildlife Fund reports that over half the topsoil worldwide has been lost over the past 150 years, mostly due to industrial agriculture. Some sources say the loss is more like 70 percent. It's possible that in 60 years, the topsoil on heavily grazed and monocropped farmlands will be gone, leaving nothing but an impervious layer of hardpan in its place, conditions that led to the Dust Bowl phenomenon in parts of the United States and Canada in the 1930s. Without its thin skin of topsoil, fertile land turns to desert, a process that has been accelerating all over the world in large part because of intensive industrial agriculture. But David Runsten, policy director of the California Association of Family Farmers, says agriculture can be part of the solution. He began working with the California Climate and Agriculture Network (CalCAN), a nonprofit that advocates for climate-friendly agricultural policy, in 2009 to get state officials to embrace carbon farming. "Finally, the governor said he would support Healthy Soils," says Runsten. The legislation passed last summer and allocates $7.5 million for the program, $3 million for demonstration projects and up to $4 million in grants of up to $25,000. Gov. Brown is sold on the program. He originally asked for $20 million once he embraced the idea. Funding for the program comes from the California Air Resources Board's cap-and-trade program. California's cap-and-trade program generates money from big emitters who are required to buy permits to emit greenhouse gases, says Renata Brillinger, executive director of CalCAN. "The Legislature and the governor decide how much [of that] money to spend and on what. It's billions of dollars that we can influence through a democratic process," she says. Healthy Soils projects must be directly linked to climate change, she says. "Farmers are getting money to do things on their farm that draws down carbon or reduces emissions. It is the only source of funding in the United States that will pay farmers to do that." One of the pioneers of carbon farming is the Marin Carbon Project (MCP). The nonprofit took it upon itself to provide scientific evidence to substantiate the benefits of carbon farming. Working in concert with Whendee Silver, professor of ecosystem ecology at UC Berkeley, the MCP found that adding a half-inch of compost to the soil increased soil carbon by one ton, or 40 percent, per hectare. Most dazzling was the discovery that the amount continued to increase by the same rate year after year without adding more compost. This research demonstrated that carbon farming "can improve on-farm productivity and viability, enhance ecosystem functions and stop and reverse climate change," explains Torri Estrada, executive director of the Carbon Cycle Institute, a Petaluma-based organization partnered with the MCP.